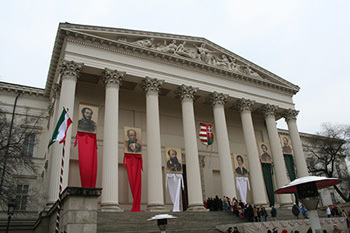 On 15th March Hungarians commemorate the Revolution and the following War of Independence against the Austrian-Hapsburg rule in 1848 – 1849.
family programs in Budapest and the rest of the country. The main events will take place in the Hungarian National Museum‘s Garden and in Buda Castle (family programs). See detailed programs on 15. March and over the weekend. Shops, markets and services are closed on 15th March, Sunday. On 15. March Public transport services operate according to Sunday/holiday schedule, meaning less frequent services. On 14. March services run according to Saturday schedule. See timetables at the Budapest Public Transport Company’s (BKK) website. Most cafés and restaurants are open though, especially in downtown Budapest. 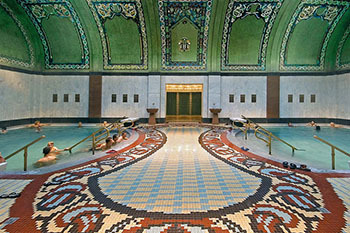 Budapest Baths are open on 15. March/Sundayand throughout the weekend according to Sunday opening hours and pricing. Széchenyi Bath (with cabin): 20 EUR, Gellért Bath (with cabin): 21 EUR. 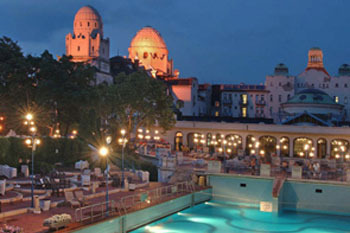 The thermal pools in the Rudas Spa are open for both women and men. The above line is quoted from the famous Nemzeti Dal (National Song) by poet Sándor Petőfi (1823-1849) and a prominent figure of the uprising. On 15. March in 1848 he recited the poem from the stairs of the Hungarian National Museum (Múzeum körút 14-16., M3 (blue) metro, Ferenciek tere station) for thousands of people. 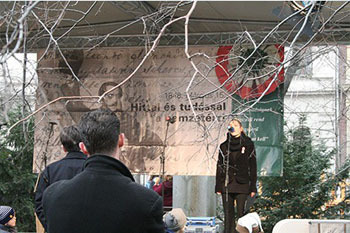 Petőfi’s passionate recitation marks the beginning of the revolution against the Habsburg regime. He was killed in one of the last battles of the war in 1849. No Revolution day goes by without reciting the National Song on the celebrations at national monuments, especially from the stairs of the National Museum. green, the national tricolours of Hungary. People also wear tricolor cockades pinned to their clothes. Read below the historical background on March 15th Hungarian Revolution and the 1848-49 War of Independence. Many events accompany the official celebrations including musical and theatrical performances as well as family activities. Kids can go a round on horse back with the help of hussars dressed in traditional uniforms in the garden of the National Museum. You can join the commemorations at several venues. The official government celebrations start with raising Hungary’s National Flag on Kossuth Square at 09.00. The main celebration takes place in the garden of the National Museum where Viktor Orbán prime minister will deliver a speech. 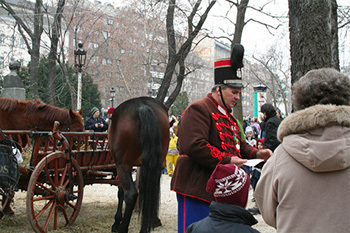 Join the various family programs at various locations in Buda Castle, and the Várkert Bazaar. All festive programs are free. 10.30 – National Museum’s Garden: Festive program – Viktor Orbán, Hungary’s prime minister will deliver a speech. Address: Múzeum krt. 14 – 16., Bp. 1088, distr. VIII. All exhibitions are free for visitors (opening hrs: 10.00 – 18.00). There will be also lectures, presentations in Hungarian related to the revolution and war from 10.00 to 18.00. Local delicacies in the fair – taste Hungarian specialties like langos, kürtös kalács (chimney cake) etc. Craft workshops for the whole family. Note: The Parliament and the Visitor Centre is CLOSED on 15. March. Open day in the Hungarian Parliament on Kossuth Square, 10.00 – 17.00 . Take a tour of the largest building of Budapest for free. 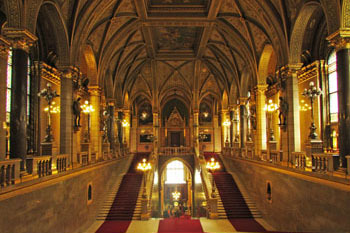 Visitors can access the Parliament from the direction of Alkotmány utca. the Holy Crown of King St. Stephen, first King of Hungary who established the Hungarian state and introduced Christianity. 16. March, 1848 m Long National Tricolor on Andrássy Av. View the 1848 meter long national tricolor along Andrássy Boulevard between Heroes’s Square and Oktogon. See also programs in the Hungarian Military History Museum, Buda Castle. You can join and learn some traditional Hungarian folk dances from the regions of Kalotaszeg, Sekler Land or Szatmár. Various military and home defense bands will play on Szentháromság Square between 10.00 and 18.00. Address: Buda Castle, Kapisztrán tér 2-4., district I. 14.00 – Dance House: join the Honvéd Folk Ensemble to learn and dance the traditional recruiting dance of the revolution and war of independence, the verbunkos. Fencing presented by the masters and students of the Hungarian Fencing School. Playhouse – on the courtyard of the museum you can try your hands at various folk plays and games. photo exhibit, movie screenings ensure great programs and activities for the whole weekend. Address: Táncsics Mihály utca 9., district I. Various skill games and contests await everyone – fun for all ages. Visit the official website of the program organizer for up-to-date details. Address: Szentháromság tér 6., district I.
Hussar trials for children (in smaller groups), 1st floor Rákóczi room: 12.00-16.00. horseshoe throwing, barrel riding, saber combat and various other skill games. Dance teaching on Szentháromság tér at 11.40 – 12.10, 13.40 – 14.10, 15.40 – 16.10, 17.20 – 17.50. A National Day cannot pass without tasty local food and the usual whirl of an art and craft fair. See how the hussars lived during the war! Visitors can also pet the horses. Address: Ybl Miklós tér 2., district I. The Event Hall of the beautifully renovated Southern bazaar of the Várkert/Castle Bazaar will host various family activities and concerts for children. 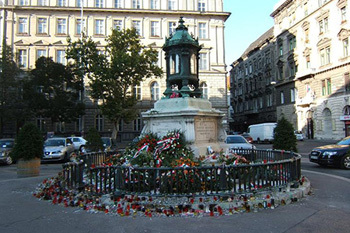 the Batthyány Eternal Flame (Batthyány Örökmécses, Báthori utca, district V., M2 metro Kossuth tér station). Count Lajos Batthyány was the prime minister of the first responsible Hungarian government in 1848-49. He was executed by a firing squad at the site of the memorial during the Habsburg’s retaliation following their victory over the Hungarian army. The eternal flame has been burning in memory of him since 1926. The Hapsburg and their allies liberated Buda from the 150-year Turkish occupation in 1686. However Hungary did not become a free country but a province of the Austro-Habsburg Empire. Hungarians fought against the Habsburg oppression throughout the coming centuries. the War of Independence in 1703 – 11 lead by Ferenc Rákóczi. The Austrians had beat down these movements. The first half of the 18th century was a period of compromise between the Austrian rulers and Hungary. Influenced by the events of the French revolution, a new resistance movement, the Jacobin, emerged in Hungary toward the end of the 18th century. transforming the country to a bourgeois society. The Jacobin movement failed too. The Habsburgs arrested and executed the leaders of the organization. The Hungarian Reform Era started in 1825 when at the diet Count István Széchenyi (1791-1860) offered his 1-year income to establish the Hungarian Academy of Sciences. 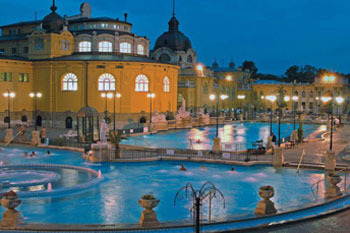 Széchenyi become a prominent figure of this era facilitating great developments in Budapest and the country. The other outstanding personality of this era was Lajos Kossuth. The spirit of nationalism arose in other European countries and capitals and they only heightened the enthusiasm of Hungarian reformers. On political level Lajos Kossuth’s fiery speeches provoked anti-Habsburg feelings while Sándor Petőfi roused common people through his uplifting poems. 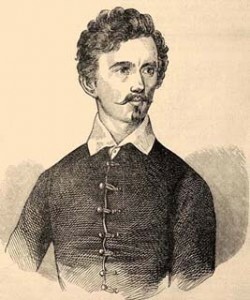 Who was Sándor Petőfi (1823 Kiskőrös – presumed death: 1849)? He’s Hungary’s most celebrated romantic poet and a fervent fighter for the nation’s independence. Petőfi roused the Hungarian people against the Austrian-Habsburg oppression reciting the verses of his National Song/Nemzeti Dal from the steps of the National Museum on the morning of March 15. in 1848 (though according to current knowledge this is just an urban legend). He also participated in drawing up the famous 12 points (also recited from the steps of the museum ) – a summary of the Hungarian revolutionaries’ demands. He wrote nearly 1000 poems during his short life (around 875 survived and are known today). Every Hungarian knows his best-known romantic poems by heart. Some of them like the At the End of September were translated into most languages of the world. His epic poem János Vitéz/John the Valiant is also very popular. It’s been made into a musical, puppet show, cartoon, and rock opera. Petőfi also wrote a lot about his homeland the Great Plain/Alföld (Az Alföld, A Tisza, A puszta, télen) raising the bleak “puszta” to poetic heights. In the War of Independence of 1849 he fought in the Hungarian army as captain. He thought to had been killed (or captured) in the last and lost battle of the war, at Segesvár on 31. 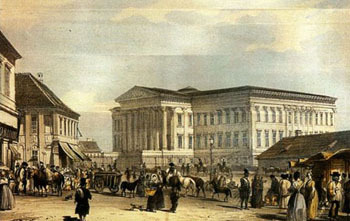 July in 1849. Today many street names, statues, memorials, museums keep his memory in Hungary and the neighbouring countries of the Carpathian basin. TIP: The Petőfi Literary Museum in the Károlyi Palace (Károlyi utca 16., district V., downtown Budapest) has one of the largest collections on the works of Petőfi as well as a permanent exhibition on his life complete with audio-visual tools and apps. Admission: 600/300 HUF. The revolutionary wave that had swept over Europe in spring 1848 resulted in a bloodless revolution in Hungary on 15th March. A bunch of Hungarian poets and writers formed the core of the radicals. They were preparing for a demonstration on 19th March at their regular meeting place, the Café Pilvax. They heard the news of the revolution in Vienna on the evening of 14th March so they decided to bring forward the demonstration. reading their demands worded in the 12 points (kids at school have to learn it by heart when they learn about the Revolution). The mass lead by Petőfi in the pouring rain occupied a press and printed out the poem and the 12-points. The Hapsburgs didn’t dare to intervene. Despite the rain, an even bigger crowd gathered in the garden of the National Museum by afternoon. Following the events on 15th March, a Hungarian delegation went to Vienna to tell their demands to Ferdinand V. After several discussions the Habsburgs accepted an independent Hungarian ministry lead by Count Lajos Batthyány. In summer 1848 Vienna decided to take action against the Hungarian revolution. The ethnic minorities living in Hungary weren’t happy with the Hungarians’ victory. The Croats allied with Austria and their troops attacked and invaded Hungary. Although the Habsburgs had more power and larger army, they weren’t strong enough to defeat Hungarians. Austria convinced Russia to provide support for breaking down the Hungarian War of Independence. Despite being a small country, Hungary humiliated Austria by fighting tooth and nail and by surrendering not to the Emperor but to the Russian Czar in August 1849. Following the defeat, retribution began. Fourteen generals were executed at Arad on 6th October 1849. Count Batthyány Lajos, Hungary’s first prime-minister was shot at Pest, and thousands were sentenced to death or prison. The Habsburgs built the Citadel fortress on Gellért Hill at that time with cannons directed at the town below. The age of terror stifled Hungary in the coming years.